Jason Marsalis received his formal introduction to the drums at the age of 3. That’s when his parents, the household heads of the famed Marsalis family that changed the face of jazz beginning in the early ’80s, bought him a toy kit. He also studied violin at 5 years old. But Marsalis’ current instrument of choice, the supremely cool vibraphone, was still years away from making an entrance into his life. “I first got a set of vibes while in high school but I didn’t seriously start to do performances on it until around 2000,” said the youngest of the Marsalis brothers, who performs a free convocation concert with his Vibes Quartet on Thursday at Berea College. “It’s an instrument I’ve worked on bit by bit. “The first appeal, honestly, was the fact that there have not been a lot of vibraphonists in jazz music compared to the number of horn players. The second appeal was that there were a lot of possibilities that just haven’t been explored with the instrument. Also, there’s the fact that it’s a percussion instrument, just like drums. But now we’re dealing with an instrument that produces actual notes and melody. One would think jazz music of any style would have surrounded Marsalis during childhood, especially with older siblings Branford (a saxophonist), Wynton (a trumpeter) and Delfeayo (a trombonist) in the house. But the reality is that for much of his upbringing, they weren’t around. Although the youngest Marsalis had racked up considerable roadwork experience by the age of 9, it was his role as drummer in the trio of pianist Marcus Roberts beginning in 1994 that garnered attention from jazz audiences around the world. Marsalis still plays regularly with Roberts around his own band projects. “I met Jason when he was 7 or 8,” said Roberts prior to his September concert at the Opera House. “He started working with me, I think, in November of ’94, so it’s now been 20 years. So I just think the world of Jason. He is a brilliant mind. He’s also a fantastic drummer, in my opinion, the greatest in a generation. Of course, on Thursday, Marsalis won’t be playing drums. He will be manning the vibes for the sleek new tunes from his quartet’s new album, The 21st Century Trad Band. This entry was posted in Articles, Press and tagged Berea College, drums, Jason Marsalis, Kentucky, LexGo, Lexington, Marsalis family, The 21st Century Trad Band, vibes, Walter Tunis on November 8, 2014 by abell. Everything old really is new again. Jazz piano great Marcus Roberts started his tribute to New Orleans jazz pioneer Jelly Roll Morton on Sunday night at Seven Days of Opening Nights with introductory remarks that also served as fair warning to what was about to happen on the stage. During the first half of the concert, The Marcus Roberts Trio and a seven-piece horn section tore through new arrangements of Morton tunes such as “Doctor Jazz” and “The Pearls” with an enthusiastic precision that was, at times, jaw-dropping. The highlight of the first half was “New Orleans Bump,” which featured a new arrangement by Roberts’ trumpet player Alphonso Horne (yes, horn is in his last name). The song may have been written in the Roaring Twenties but it sounded fresh and new as Horne pumped it full of strutting swagger. The arrangement also left plenty of room for Roberts to take off on a wild improvisation that was so full of charging rhythms and counter-rhythms that it could cause dizziness. Remember the name Horne, who studied jazz at Florida State College of Music with Roberts as one of his professors. Horne has a big future in front of him. The crowd of 710 in Ruby Diamond Concert Hall let out whoops and “wows” throughout the evening, whether it was for trills on the clarinet or a mind-bending improv from Roberts that sounded like boogie-woogie from another planet. Anyone expecting a stodgy museum piece or dry recreation of a Dixieland band was sadly mistaken. The band lineup included Jason Marsalis on drums, Rodney Jordan on bass, Tim Blackman Jr. on trumpet, Jeremiah St. John on trombone, Joe Goldberg on clarinet, Tissa Khosla on baritone, Ricardo Pascal on saxophone and Stephen Riley on tenor saxophone. The concert had been billed as an octet but, hey, who cares if you add a few more players when they are this good? Morton, who got his start playing in the brothels in his hometown of New Orleans, was a flamboyant figure who claimed he invented jazz. That may or may not be true, but he certainly was the first musician to sit down and notate the rambunctious new music of the 20th century. He also rubbed a lot of the other musicians the wrong way with his bragging and his flash (he had a diamond tooth), so that is probably why he was not well remembered when he died in near-poverty in the early ’40s. While the party-hearty Morton may not have made it to the Pearly Gates after his death, he was definitely smiling his diamond-tooth smile somewhere in the great beyond on Sunday night. Roberts, who turns 50 this year, is no stranger to the Seven Days. He and his group put on a memorable show with jazz singer Dianne Reeves a few years ago. Anyone who saw his reinvention of George Gershwin’s “Rhapsody in Blue” at Seven Days probably wondered how he could top that performance. The Seven Days of Opening Nights continues today with a screening of a film that was hand-picked by Tribeca Film Festival honcho Geoffrey Gilmore. The title is being withheld until showtime at 8 p.m. It is sold out. This entry was posted in Articles, Press and tagged 20th century, Alphonso Horne, baritone, bass, boogie-woogie, clarinet, diamond tooth, Dianne Reeves, Doctor Jazz, drums, Florida, Florida State College of Music, Geoffrey Gilmore, George Gershwin, horn section, improvisation, Jason Marsalis, jazz piano, jazz singer, Jelly Roll Morton, Jeremiah St. John, Joe Goldberg, Marcus Roberts, new music, New Orleans, New Orleans Bump, New Orleans jazz pioneer, octet, Pearly Gates, Press, Rhapsody in Blue, Ricardo Pascal, Roaring Twenties, Rodney Jordan, Ruby Diamond Concert Hall, saxophone, Seven Days of Opening Nights, Stephen Riley, Tallahassee, Tallahassee Democrat, tallahassee.com, tenor saxophone, The Pearls, Tim Blackman Jr., Tissa Khosla, Tribeca Film Festival, trombone, trumpet on February 18, 2013 by abell. JASON MARSALIS: I got started playing jazz as a kid when I was six years old. That is when I started playing drums. Jazz music was always something I loved. I loved listening to it and knew that it was something I wanted to play as well. Plus, I had great family support. That was how I really started out playing in New Orleans. FJ: Was it by process of illumination, with your father Ellis playing piano, Wynton playing trumpet, Branford, saxophone, and Delf, trombone? JASON MARSALIS: Well, that had nothing to do with it, as far as what my other family members were playing (laughing). The first instrument I played with the violin. That was really my first instrument. My father got some sort of deal through the elementary school that I was attending at the time. When I was three, my mother and father used to play this game with me. They actually had a toy drum set. They had a toy drum set and they would always introduce me like I was on some performance stage or something. They would say, “Ladies and gentlemen, we now present to you, the great, wonderful Jason.” I would start banging away. I guess that maybe stuck in my mind somehow, but I eventually choose that instrument a year after playing the violin. FJ: In a past life, I played the violin, so I am empathetic to your switch. JASON MARSALIS: Well, when I first started playing the violin, it was hard to play, but I kind of liked playing it. I wasn’t the most serious musician, but I liked playing it. Years later, when I was about twelve years old, a lot of things happened. The instrument got more difficult and I was losing interest and I was also more interested in classical percussion. That had to do with us moving to Richmond, Virginia for three years, which had no jazz scene. I had always played in these student orchestras and I believe it was my last year in Richmond. I was in this youth orchestra and I believe it was the first orchestra that I was in that actually had a percussion section. I was upset that I wasn’t in the percussion section because that is where I wanted to be. To make matters worse, one of the guys playing timpani didn’t know what he was doing. He was playing all kinds of wrong notes and the conductor couldn’t hear it. The violin was getting more difficult as far as playing second position and I was getting less and less interested in playing the violin. I wanted to pursue percussion and so when we moved back to New Orleans, which was the summer of ’89, that is when I decided that I was not going to play violin anymore. However, Fred, I did want to study percussion in classical music. FJ: Did you feel any pressure at all from the expectations of being a Marsalis? JASON MARSALIS: Nope. None what so ever. The only time when there is pressure is if I was doing music and I didn’t want to and I only felt like I did it just to either please the family or I felt like I had to live up to something, but that wasn’t happening at all. I loved playing music. Music was something I loved doing. The only pressure that could be possible is maybe living up to a certain legacy and even then, that didn’t affect me at all. FJ: You worked with your father’s trio for a lengthy period of time, what knowledge did he impart upon you? JASON MARSALIS: The first thing I learned playing in his trio was how to play on a ballad and how difficult playing on a ballad was. That was one of the first things. The second thing was how to play in a jazz trio, which took me a minute to conceptualize. I also gained a certain respect for standards. FJ: Is that an aspect many younger musicians are ignoring? JASON MARSALIS: Oh of course, absolutely. That is a lot of the problem with a lot of younger musicians today is that there is a lack of knowledge as far as jazz history is concerned across the board. I have to do more work on it myself, just learning drum solos and learning more drum vocabulary. You find musicians now who don’t know a lot of standard songs. FJ: Why do you feel that is? JASON MARSALIS: The reason that is, is because those standard songs were the popular songs of my father’s day, which is why it is that he and my mother, who does not play music, knows those songs better than I do. Those were the popular songs of their day, coming from those musicals. I learn part of this from playing with my father. A lot of the younger musicians don’t know a lot of those songs. FJ: Is that detrimental to their progress overall as musicians? JASON MARSALIS: It can be. You have to have some sort of historical background in order to really play the music. If not that, than definitely learn the vocabulary of the music and the history of the music. Even when learning the vocabulary of the music, eventually, you will have to learn standards. Those are the songs and tunes that those musicians play. Be it Louis Armstrong or Bud Powell or Charlie Parker, the songs that they were playing were all standards anyway. FJ: Let’s touch on Los Hombres Calientes. JASON MARSALIS: First off, I want to make that straight off the bat because there are a lot of misunderstanding that it is my band, which it really isn’t. It was a band that was put together by Irvin Mayfield. He was the one who put the band together. I remember he called me one day. It was like January of ’98 and he told me about this gig that he was going to do. When he told me about it, “I said that is great.” Bill Summers would have these percussion meetings every Saturday at his house and other percussionists would get together and play Cuban rhythms and I learned a lot from those meetings. When Irvin called me about that gig, I asked him if he had been to Bill’s house and he said, “No.” I said, “Well, that is something you need to go check out before you even do the gig.” He went over there and he was really the one that put the band together. FJ: Let’s touch on the two volumes you recorded for Basin Street. JASON MARSALIS: Well, I hated Volume One and I still do to be honest with you, Fred. The reason for that was because that record was done straight out of the band’s first gig. We did one gig and bam, we were recording. At the time, I thought it was a little rushed and I was like, “Hold on. We just got started. We can’t just start recording.” The way recorded it, a lot of the musicians we not comfortable. We did a lot of overdubbing more so than live playing. Also too, the sound wasn’t that great either, which I think had to do with the equipment that was being used. Also, the spirit of the band was not captured on Volume One. That is something that a lot of people did hear when they heard the band live and then heard the record. They would always comment on how the band was better live and how we needed to do a live record and I would say, “No, we just need to get better. That is all it is.” So when we did the second record, which is much better, the band had been playing for a long time and we were more prepared to do the second album. Also, another thing is that we explored more genres. The first record is mostly Cuban based. So I told him that for the next record, we need to expand on that. We need to have a reggae tune, some samba stuff, funk tunes, and expand beyond the Cuban sound. FJ: And your own debut, Year of the Drummer. JASON MARSALIS: There was still some experience that I still needed to gain in working in the studio, which comes through time. Other than that, I was comfortable in some aspects because I had done some studio work and so I was pretty prepared. As far as how the album came out, I thought it came out pretty good. There were still some things that needed to be worked on, such as sound production and so forth. That is something you learn over time. FJ: Let’s talk about your latest, Music in Motion. JASON MARSALIS: My new album is coming out tomorrow. That record is also better than Year of the Drummer as far as sound production and as far as the band is concerned. The band on the last record wasn’t quite as prepared as the one on the new one. The difference is we had a lot of chances to play it and we did a lot of gigs. FJ: It is comprised entirely of your own compositions. JASON MARSALIS: One of the advantages that I had is fortunately I have had brothers who have made a lot of records and they can do whatever they want. On Basin Street, I was able to do whatever I wanted. Mark, the owner of the label, trusted me and so I did do that. But I did want to go in and record original music. FJ: You also produced the recording. What were some of the non-musical tick tacks you had to concern yourself with? JASON MARSALIS: Well, I had to oversee the sound. What order the tunes went in. The artwork and so forth. The actual putting together of the CD. FJ: Do you enjoy producing? JASON MARSALIS: Yes, I do. I learned a bit about if, obviously from Delfeayo. I do think that as far as producing goes, there is still some things about the sound and technical things that I am still not as quite knowledgeable with. The engineer would run the board and I would guide him as to how I wanted it to sound. FJ: What is the role of a good drummer? JASON MARSALIS: The role of a drummer is to keep the groove. The drummer supports the band. This is the same thing whether it is jazz, rap, R&B, whatever. The drums is what supports the group. The drums is what drives everything. In jazz music, the drums can go beyond that role. In order to go beyond that, you have to understand it. You have to understand the original role. There are things that the drummer can do within that role that can change. Sometimes, there have been instances that drums can be really flexible with the time and as far as one, two, three, four and as far as the pulse is concerned. There are some people, particularly horn players who don’t like that. There are horn players out there who want you to keep everything the same. They just want something that is comfortable for them to solo over. FJ: How would you describe New Orleans? 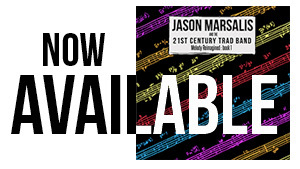 JASON MARSALIS: The music. I will give you one example, Fred. I was watching Boomerang in North Carolina, visiting some friends and there was a scene where Eddie Murphy is at a club and the Rebirth Brass Band was playing. I was like, “Rebirth, oh man, OK.” The people that were watching were like, “Who?” Rebirth is big in New Orleans, but they don’t know what I am talking about. The funny thing is, the next day, I was at a CD Superstore and one of the guys that worked there and said, “You have seen the movie Boomerang. What was that band?” I said, “Rebirth Brass Band. Their records are on Rounder Records.” That has happened again, with that same band. In New Orleans, they are just really big and that is how it is in New Orleans, period. FJ: What is the coolest thing about being a Marsalis? JASON MARSALIS: I never thought of that as meaning anything. To be honest, Fred, family is just family. That is all that is. And plus, there are people that identify things with “Marsalis,” that frankly, doesn’t make much sense and is a waste of time. Especially like philosophical views in music. This whole nonsense about being a purist musician and what not. Some people associate that with Marsalis and that is really stupid, but there are fools out there doing it. I remember when I was in college, I was listening to some fusion records, the real fusion not that Eighties trash, like Return to Forever and Weather Report. Some other college student, who was a jerk to be honest with you, he says, “Yeah, man, it is good to see that you are into fusion.” I asked him why that was and why that was an issue. He said, “You are from a purist family.” I was like, “What with people like Branford? He is a purist?” There are these views that people associate with Marsalis and family. That is really just a waste of time. The family is full of individuals. This entry was posted in Articles, Press and tagged American politics, ballad, Basin Street Records, Bill Summers, Boomerang, Branford Marsalis, Bud Powell, Charlie Parker, classical music, classical percussion, college student, conductor, Cuban rhythms, Delfeayo Marsalis, drum set, drum solo, drum vocabulary, drums, Eddie Murphy, Eighties trash, elementary school, Ellis Marsalis, engineer, funk, Irvin Mayfield, jazz history, jazz scene, jazz trio, jazzweekly, Kennedy, Los Hombres Calientes, Louis Armstrong, Mark Samuels, Music in Motion, musical instrument, New O, North Carolina, percussion section, performance stage, piano, popular songs, press-j fred jung- jazz weekly, R&B, Rebirth Brass Band, reggae, Return to Forever, Rhythm and Blues, Richmond, Rounder Records, samba, saxophone, serious musician, sound production, standard songs, student orchestra, timpani, toy drum, trombone, trumpet, violin, Virginia, Volume One, Weather Report, Wynton Marsalis, Year of the Drummer, younger musicians, youth orchestra on February 6, 2013 by abell. In New Orleans music circles, if your last name is Marsalis (or, for that matter, Neville) you have a reputation to live up to. Jason Marsalis is well aware that his family name carries certain expectations. The youngest of Ellis and Delores Ferdinand Marsalis’ six sons, the spotlight swung to him when he began playing jazz professionally at the age of 12. He’s 33 now, and clear of the shadow of his famous dad – and of his brothers Wynton, Delfeayo and Branford. He’s an expressive, innovative drummer, and composer, and a restlessly creative musician, and on Sunday he’ll introduce a new quintet at a concert inside the Mansion on Forsyth Park. With this group, Marsalis plays the vibraphone. Recently, heads turned and eyes bugged when Marsalis made a tongue–in–cheek “public service announcement,” in the form of an online video, in which he railed against “Jazz Nerds International,” young musicians who are into pushing the boundaries of jazz for what he believes are all the wrong reasons. Your mantra has always been “jazz has got to keep moving forward.” What do you mean? Jason Marsalis: If anything, there are probably those who are accusing me of trying to move it backwards right now! I’ve caused a lot of buzz lately in the jazz world because of this Internet video. The thing about it is, the music is always going to move forward. It may not be in mainstream culture right now, but it’s always going to move forward, and there’s always going to be people bringing in other ideas. So it’s going to happen whether we want it to or not. The video has to do with music students who reduce the music of jazz to an intellectual exercise. And they’re only attracted to the abstract elements of the music. That’s all it is. For example, if a nerd was to hear the music of James Brown, their response would probably be “Oh, this has two chords. So what?” They’re not gonna get that there’s a strong groove, and that there’s people dancing to it. All they want to hear is the complex elements while ignoring the simple elements. There’s music students like that all the time. That’s the opposite of what music is, don’t you think? It’s supposed to make you feel. Jason Marsalis: Exactly. My whole point is that there’s a lot of things that jazz music can do, and will do. Whether it has to do with swingin’ out, or a groove, or a ballad, or mellow or angry, there’s a lot of emotions that the music has. My view is that all of those moods should be explored. But the nerd tends to look at one thing: How can we play as abstract and innovative as possible, and we’re not interested in anything else. Because it’s already been done, and we need to move on as quick as possible. Why did you start playing vibes? You’ve described the instrument as “melodic percussion” – was it a logical step from the drums? Jason Marsalis: I wanted to do it because there was a lot with vibes that hadn’t been said. There’s a lot that has been contributed, but there’s much more to be done. There haven’t been as many jazz vibraphonists as there have been jazz trumpet players, or jazz saxophonists, or jazz pianists. There’s other possibilities with that instrument that you cannot explore on drums. Now I will say that on drums, there’s vocabulary that can be contributed in terms of rhythm, and in terms of space – which not a lot of drummers are really addressing. But with vibes, there’s a lot that you can do with a melody that you can’t do with drums. A lot of the songs that I write for my vibes group, it’s different from the music I write if I’m playing drums leading a group. Because I have the melody, and I have to be sure I’m playing the melody correctly. With drums, that isn’t the case. Why do you think some people find a direct line to music, as opposed to, say, dreaming of becoming a doctor or some other career? Jason Marsalis: The stories I’ve heard are that I was into music as a kid, I mean age 3. According to my parents, I was just loving music as a toddler. As I grew up, my brothers were making records – and I actually liked those records – and after a while I started to love the drums. And I wanted to play the drums. I was around it a lot, but I believed it and I wanted to contribute something to it. And being in the city of New Orleans, there’s a lot of music and culture that isn’t available in other places. In defense of those jazz nerds, they don’t get a lot of access to jazz as a fun music; jazz as a way to make people dance. You had a family name to live up to. Did your parents ever say “Aw, you’re just the little brother”? Jason Marsalis: Not in the music sense. Now, in the life sense, that’s a little bit of a different story! I think it’s because I played a rhythm section instrument. So if anything, that was seen as being different from Wynton and Branford. From what I was told. That’s one. Two, I had the belief and talent in music at a very early age. This entry was posted in Articles, Press and tagged abstract elements, Bill DeYoung, Branford Marsalis, complex elements, Connect Savannah, creative musician, Delfeayo Marsalis, Delores Ferdinand Marsalis, drummer, drums, Ellis Marsalis, expressive drummer, fun music, Hilton Head, innovative drummer, intellectual exercise, Internet video, James Brown, Jason Marsalis, Jason Marsalis Quintet, Jazz Corner, jazz music, Jazz Nerds International, jazz pianists, jazz saxophonists, jazz trumpet players, jazz vibraphonists, life sense, mainstream culture, Mansion on Forsyth Park, melodic percussion, music sense, music students, Neville Brothers, New Orleans, New Orleans music circle, online video, Press, public service announcement, quintet, simple elements, strong groove, tongue–in–cheek, two chords, vibes, vibes group, vibraphone, Wynton Marsalis, young musicians on August 31, 2010 by abell.